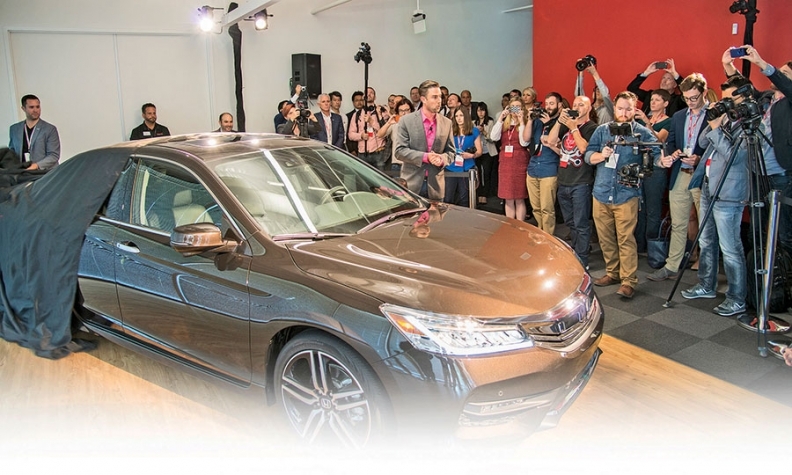 Honda unveils the freshened 2016 Accord sedan during a showing of the company's sprawling Silicon Valley r&d center. MOUNTAIN VIEW, Calif. -- On a Thursday afternoon inside Honda's new Silicon Valley research lab, a handful of Uni-Cubs -- think motorized bar stools that riders control by leaning this way or that -- are ferrying journalists around a brightly lit room under the watchful eyes of engineers giving tips on how to steer. If the gadget is a little odd, so is the fact that Honda, a traditionally modest, tight-lipped automaker, let any outsiders into the lab to begin with. The rare public showing was part of last week's opening of the company's sprawling 35,000-square-foot r&d center here in the heart of Silicon Valley, where it has united once-disparate strands of its research work and connected them with a technology incubator for other potential research partners. Honda used the event to debut the freshened 2016 Accord sedan, one of the first few cars on the market whose infotainment system will play nice with the smartphone software from two nearby tech companies: Google and Apple. But for Honda, it was also a chance to reassert its place among the world's leading research companies. Paluch: Harvest technologies of tomorrow. "We're really excited about this," Frank Paluch, president of Honda R&D Americas, told Automotive News. "It's the next step in the expansion of what we've already done here, and this collaboration and partnership is going to give us new seeds that we can plant today to harvest the technologies of tomorrow." Honda Motor Co.'s presence in Silicon Valley isn't new; the company set up shop there in 2000 and formally opened a lab in 2003. That was years before a wave of automakers established operations on the tech industry's home turf in hopes of luring top young engineers and programmers to their increasingly software-driven business. Honda was also well ahead of its competitors in identifying itself as a "mobility" company, rather than just a car company. Its range of products underscores this: Under the "red Honda" corporate banner, the company makes everything from walking-assist devices to outboard motors to motorcycles by the millions, and soon a five-passenger jet. No wonder Honda spends so much on r&d. From 2006 to 2014, the auto industry spent an average of 11.4 percent of its revenue on r&d and capital expenditures annually, according to AlixPartners, a New York consulting firm. Honda's total: 17.5 percent annually, far outpacing No. 2 BMW. For the fiscal year ended March 31, Honda reported ¥662.6 billion ($5.5 billion) in r&d expenses, and forecast a 7 percent increase for the current fiscal year. But with more glamorous companies such as Apple, Google and Tesla drawing oohs and aahs in auto circles, and many of its mainstream competitors rapidly expanding their presence in Silicon Valley, Honda has felt a need to remind the tech and transportation industries -- not to mention consumers -- of its engineering might, said Jack Nerad, executive market analyst at Kelley Blue Book. "Forty years ago, Honda was the young upstart of that era," said Nerad. But after watching Honda pump out reliable, mainstream products, he said, consumers have forgotten that disruptive mentality. The new Silicon Valley r&d center is part of a renewed effort to get disparate teams to work together and better project that innovative streak. The move was championed by two executives who have risen to the highest ranks at Honda, Paluch said: Takuji Yamada, named CEO of American Honda Motor Co. in April 2014, and Takahiro Hachigo, who became Honda Motor Co.'s CEO in June. They wanted departments and programs to avoid the silo effect and gain a better understanding of how seemingly unrelated projects can share components. Such as the Uni-Cub. It uses an angle sensor Honda initially developed for its Asimo robot, which later found a home in its MotoGP racing motorcycle and finally in the current generation Honda Civic. 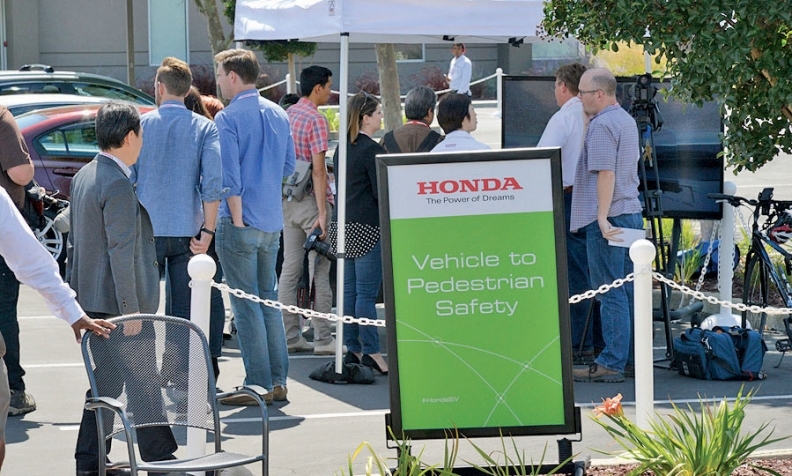 Media members line up for a tech demonstration at Honda's center. Honda also will use the Silicon Valley location to collaborate with outside companies - even the smallest two-man shop in a garage - in an incubator role. This is crucial, Paluch said, because technology is advancing faster than any automaker can keep up with on its own. "We can't do it all ourselves," he said. "So we're trying to look more collaboratively." Last week's open house followed Paluch's speech at the SAE World Congress in Detroit, where Honda was a leading sponsor. The company used the SAE event to bring together for the first time Asimo, a full-scale mock-up of its HondaJet fuselage and a display model of the upcoming Acura NSX hybrid supercar. And this week, Honda has invited journalists to an event outside San Diego where they'll be able to test the 2016 Accord alongside a slew of other motorized products. There's also a strategic reason for all the public hand-waving by Honda: The company wants to distance itself from the Takata airbag crisis. Though many other automakers have been involved, Honda has borne the brunt of it, said Jeffrey Rothfeder, author of Driving Honda who has covered manufacturing for 20 years. "They've really been shocked by this and really publicly embarrassed," Rothfeder said, "and I know their push on r&d is an effort to get ahead of the story and really go back to what they do best, which is r&d."